I've finally started to use the yarn that my Snookums bought me for my birthday. 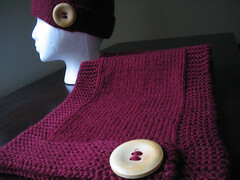 In this little number, you see me working with Cotton Ease in "Violet". The camera makes the yarn look more blue than violet. I figured it was about time to start working on some warm weather wear. 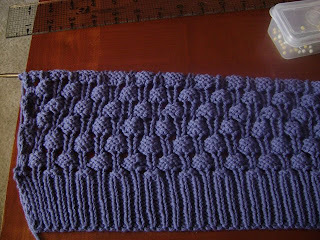 I found this stitch pattern called "Berries in a Box" that I thought looked really cool. In the book, it looks like rows of bricks, why, with the way the reverse stockinette pattern is staggered. 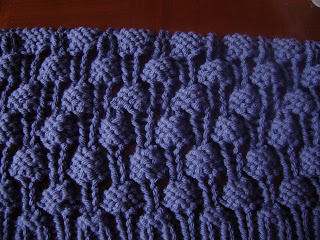 When worked up, the stitch is actually kinda "bobble-y". And you know how I feel about the bobble. They make me feel icky because they remind me of boils. I do like them, though, on kid's sweaters...but not too many. I might not want to touch the kid if he/she looks like he/she has cooties. I'm only going to work this stitch on the front of the tank. I think I want the back to be all stockinette stitch. We'll see. 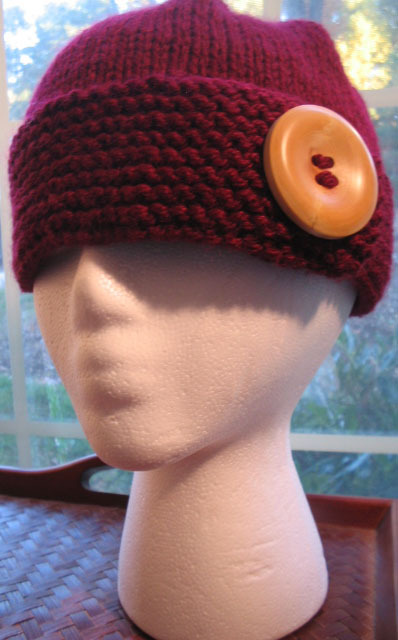 I have the design worked out in my head, but it is totally subject to changes as the knitting progresses. I can't figure out what I want to call this yet. Maybe it'll come to me while I work.